Northern Territory North West: Darwin has become a truly cosmopolitan city with immigrants from over 50 countries having settled here. Here, the lush rainforest north of Australia has wonderful scenery, outdoor adventure and authentic Aboriginal experiences. Katherine has developed into a major regional centre and tourist spot to visit. Only some thirty minutes from there is the Katherine Gorge National Park, famed for its deep river gorges and rainforest rock pools, carved out of 1,650 million year old red sandstone. Next Picture: North East NT Map - North East NT Map. 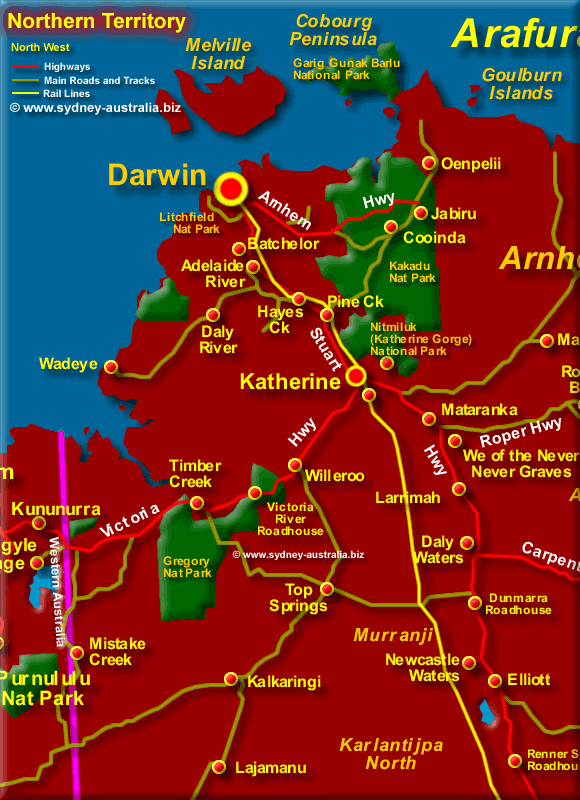 Previous Picture: South West NT Map - South West NT Map. About the many NT parks and reserves in the Northern Territory here: Northern Territory National Parks.